scary fashion snapshot #2: wellies with a skirt, wabes, wellies with a skirt! we've been getting pelted with ice all morning, so i've been grateful for them. and i'm totally prepared if i have to go hunting for C.H.U.D. - so there. ooh, mind-meld! over wellingtons, of all things. why can't i mind-meld with, say, the guy who is going to pull lottery numbers or the weather man? we've snow over a foot here. if it keeps snowing, even the wellies aren't going to save me. But it's fluffy snow. Heart-attack snow is the worst. Fluffy, I can deal with. today i was wishing for some wellies - though the weatherproof canadienne boots did the trick - and i never doubted for a second that you could pull it off. it's just that my legs & waist tend toward stumpy when cut at wellie-&-skirt levels. my lake effect story is jengadda shoveling her car out of the airport parking lot with a frisbee. and then you all are freezing your asses off in chicago. why do people live near these great lakes, anyway?! Well, May is nice. October too. Those two months are pretty solid, all things considered. Random Stab At Fashion No. 2 (hopefully better than previous). 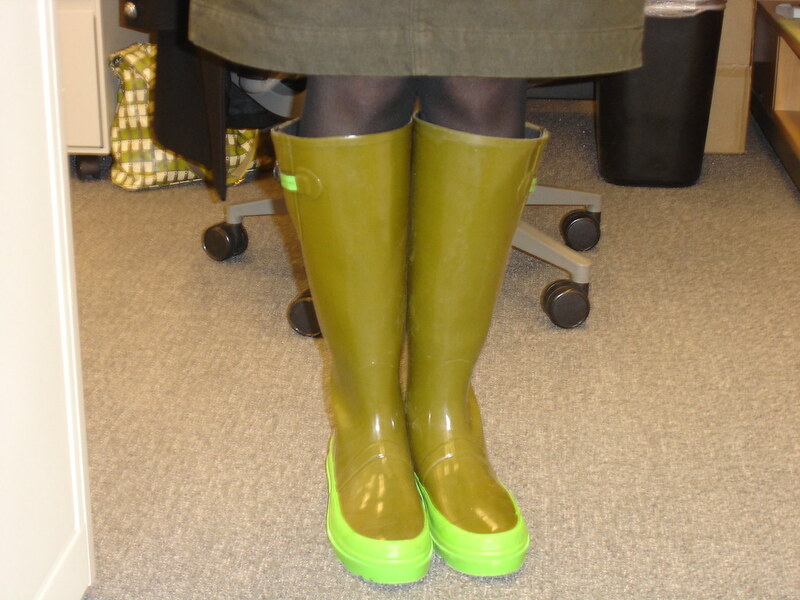 If wellies are a no-no, would (ankle-high) black rubber galoshes be a better choice? Frankly, I can't remember anybody owning a pair, except for my dad, back in the 80s. I don't know where one could get 'em nowadays. But, for the wellington-adverse: a reasonable alternative?